My intention today was to not write about programming, however I've been marking all day and my brain just can't come up with more than one paragraph of my original subject, so, programming again it is! One of the gaps we'd identified early on with the introduction of more computer classes that I blogged about here was the need for more technical support. We also quite often had phone calls trouble shooting various things as well as people coming in with IT equipment they needed help with. We thought we'd trial setting aside a particular time a week to have a drop-in technology familiarisation workshop, predominantly aimed at those needing help with anything technology related. The help given is wide and varied, including setting up accounts on mobile phones, learning how to send an SMS on a new phone, connecting to personal or library WiFi, using eReaders, downloading from Overdrive to iPads, Kindles (sorry no go!) and tablets and using Facetime on the iPad. We started with one on a Thursday morning and now run another for Seniors on Tuesday afternoon. Because of the increase of people in the community who have acquired technology, TechTalk has become an important program that we run. One of the aims of these sessions was to have participants involved to the point where they would be able to help each other and this happens quite frequently now. When I blogged on day 2 about some of the initiatives that had been implemented at the time of giving my branch update, I was reminded that, at the time, there were also things in development that have since been implemented; One of these is iTots. iTots is a program aimed at 3-5 years olds that is designed to show parents some of the educational benefits of using ICT at a young age. The aim was to demonstrate that technology can be a useful tool for preschool literacy and numeracy, creative play and school readiness. Explore: using apps to explore science. It would probably come as no surprise that most of the participants owned smart phones and had used apps such as Talking Tom so were at least familiar with this type of technology. The sessions were first run with no formal marketing, only inhouse promotion and were limited to 9 places (we had 10 iPads). The next session was included in our service wide marketing collateral. We then ran another 2 which ended in November. Its popularity means I am seriously considering running it on an almost continuous basis in 2013, with some minor tweaking to the program. I do love how libraries are integrating traditional forms of programming with technology. I am hoping now that iTots will soon be implemented across the library service. This morning some colleagues and I had a discussion via Twitter on core services in public libraries. The conversation centred around thoughts of what constituted a library's core business and who decided what "core" was-the community, the library service or perhaps the library staff. Resourcing came up, namely staffing and funding, but I would imagine space could well be another issue faced by many libraries. I'm fortunate in that I have a large branch and a large team but it is so often assumed that this makes it much simpler to run many programs and events. This isn't the case. A large branch also means that more staff are needed on the library floor at one time and,believe it or not, it can take quite a bit longer to do things because of the volume of work and the size of the floor space. Having said that, I can well imagine the frustrations of a smaller, under resourced library and what the staff must go through to get anything done. I do believe though, very strongly, that where there's a will there's a way and there is always some way that programs can be developed and implemented. To me, a potentially fast way to facilitate some sort of community program is to put out an EOI in the library for some externally created groups to be actually run in the library. This can be a Book Group, a computer class or a patchwork group, utilising strong interests held by members of the community. Having someone keen to do this usually means they'll be a driver behind attendees participating and continued attendance, ensuring longevity for the group/s. Volunteers in the library can be another way to implement something, even if it is a one off event, such as, for example, a card making demonstration, strategically held before Mother's Day or Christmas, or running a weekly homework help group. Having the library available for community groups to hold events is another really good way to bring people to the library. Most of the time these groups will have their own promotional avenues which really helps with building an audience. Creating a variety of programs is not without its challenges but I really do believe that little things can be done and constantly built upon to create meaningful and interesting programs for the community. There is also potential for these things to be used as leverage for future funding endeavours, for example using statistics gained to add weight to grant applications or to show merit for continued programming to funding bodies. I would be interested to hear from others on interesting ways they found to run programs in their libraries. On day 2 I spoke about some of the programs that are now being offered in my branch (and which some of the other branches have taken on board, yay!) and hope to elaborate on these more in future blog posts. I sometimes think it is so easy to get caught up in not being able to do things, on whether they are sustainable or even able to be implemented. It's a mind set that is very simple to slip into, much harder to train yourself out of. I had a discussion with a colleague once about her feelings on the need for us to be cautious with what we offer, as we are not early childhood specialists. Quite honestly I don't think you need to be an early childhood specialist to offer many of the programs or services that we do. We don't teach, but I don't know of any library that says that they are. There are many ways that we can add value to children's programs that cost little or no money. Something that I spoke to staff about implementing this year was Letter of the week as an addition to our Toddler Time program. 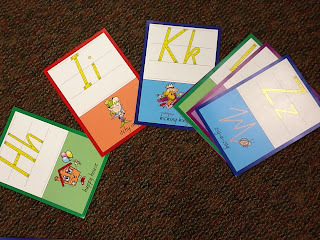 Every week the staff member shows the next letter of the alphabet, pointing to the picture on the card and mentioning one or two other common nouns that start with that letter of the alphabet. The children then take home a colouring sheet about that particular letter. This has the added benefit of prolonging the children's memories of their recent visit to the library. Approximately once a year each Branch Manager in our library service is required to give a brief rundown of what has happened in the branch in recent times. A few months ago it was my turn, however rather than give the usual rundown, read from notes on a sheet of paper, I put together a brief slideshow of photos that I could have running in the background while I gave an update on my branch "then and now". It's important to note that our service recently went through a branch restructure where we now deliver programs and services in three key areas - Reading, Meeting and Learning. I developed my presentation around those three areas. Compared with the delivery of programs in 2008-2009, when we were running 3 children's programs per week during school terms and another 2 specialty programs per month, at the end of 2010-2011 we were running 10 children's programs per week plus 5 specialty per month. Number crunching all the statistics (yes, librarians love statistics!) shows that children's program delivery has increased by 271% and overall attendance at these programs has increased by 221%. That's a much larger section of the community now benefiting from what we offer. The staff and I both feel that there are many ways the community can benefit from using the library, aside from us running programs and from traditional lending services. We've worked with many community groups so they now use the library to run their own programs. We have at least 10 community groups using the library per week and these are all self facilitated, easing the staffing and financial load. Some of the classes that are being run include a knitting group, patchwork group, diabetes self help group and Mandarin computer classes. Again, when comparing figures from 2008-2009 to those from 2010-2011, holiday program attendance has increased by 105% and the branch's footprint has gone up by 12%. This would have to be the area showing the most increase, both in program delivery and attendance. In 2008-2009 we were offering 2 PC instruction classes a month; in 2010-2011 we were running 20 per month. This works out to be a massive 900% increase in delivery and 1800% increase in attendance. Classes cover seniors, tech talk, shopping online, downloading eBooks and troubleshooting technology as well as the standard Introduction to PCs 1 and 2, Introduction to email, Introduction to Word and Introduction to the Internet. My plan is to discuss some of the initiatives I mentioned above in future posts, as well as some newer things that are now in place. What does your library service do to encourage community engagement? So today is Christmas Day and also the first day of a challenge that has been happening for at least the last three year, blogging every day for the 12 days of Christmas. This initiative starts on December 25 and ends on January 6. I always try to take part in this challenge as it forces me to reflect more and actually put some words down somewhere. I had initially decided not to join in this year, but in an effort to think about things more, I am joining in, yet again.